I had my weekly trainings with TennisUP this morning, when I learned from one of my co-founders (yeah!) that there is an ongoing Racquet sale at Toby's SM North. From what she had said, there is a HUGE price drop from the racquets' original prices. I currently have a tennis racquet though it's not mine, it's my uncle's. 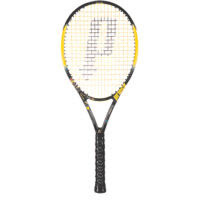 I had been using his Wilson Graphite Quad racquet ever since I started getting serious with tennis. 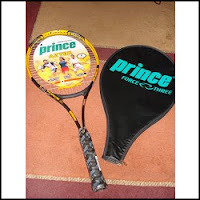 I also have another racquet in possession, a Prince Force Three, which is actually Norman's. This I swapped with my other uncle's (1st degree Aunt's husband) old unclassified Wilson racquet. The Prince Force Three was the racquet I used when I won (eng'g champ) in the Eng'g week '05 Lawn Tennis tournament hosted by UP ACES. I got a bronze medal at that tournament. The gold and silver were non-engg students; thus, I got the full EWOC points for that event. Having 2 racquets in possession, I really don't need for another one. In fact, I plan to buy tennis shoes. I'm losing the soles of my Umbro shoes, which is not really fit for sports activities. It's just basically sporty sneakers. However, the price drop is simply irresistible. Eventually, I had bought an Php8,500++ worth tennis racquet for an affordable price! Not that I'm buying something redundant, at least this new racquet of mine has different features from my current possessions. Introducing, the Prince Thunder Extreme Titanium! My first two racquets are Oversized ones, meaning having larger net area. My new one is a midsize and a longbody, so I guess I have to adjust my playing style. Really can't wait to test it on the courts!